Square Enix's JRPG gets a few much-needed additions. 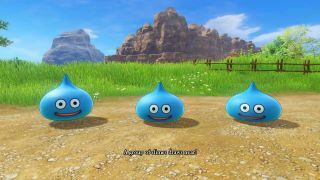 Dragon Quest 11 has received a pretty substantial patch that let players unlock the framerate of the game, as well as fixing a few crashes. There are other worthwhile tweaks besides. The command selection cursor can now be moved with the WASD keys, and you can apparently change the in-game language by altering the language of Steam itself. Players can now send crash reports to the developers, and a specific crash that occurred when players were standing 300 metres from their horse has now been nixed. Read the full list of tweaks here. Opinion on Dragon Quest 11 is mostly positive on Steam, and I think game's appeal varies depending on how much you're in the mood for an extremely traditional JRPG. Chris Schilling's sentiment on the game in our review largely sums up the light disappointment I had when picking up Dragon Quest 8 on PS2 many years ago. "For better and worse, this is a stubbornly orthodox JRPG: even if you’re not familiar with the series, you’ll surely get the feeling you’ve been here before."